A Superfood Wedding Cake? Those beautiful cakes don’t have to be nothing but sugar! Wedding cakes have a bad rap for being either too sweet, stale, or just plain old bad for you. When people think of wedding cakes, images of decadent fruit cakes or chocolate cakes filled with ganache — and then covered in inches of thick frosting — come to mind. But what if you could make your own wedding cake, and bake one that isn’t just delicious, but extremely healthy as well? The trend of creating your own wedding cakes has taken off. As A Practical Wedding notes, it’s a great way to save on wedding expenses, especially if you have a baker in the family. Even with the cost of ingredients and equipment, the cake will still be cheaper than one you can get from a professional baker. Plus, you get to call all the shots, and experiment on different flavors and frosting types. One of the best examples, in my opinion, is the blog This Rawesome Vegan Life by Emily. Her baking recipes are full of superfoods. She just published a cook book about raw vegan desserts too, check it out here. 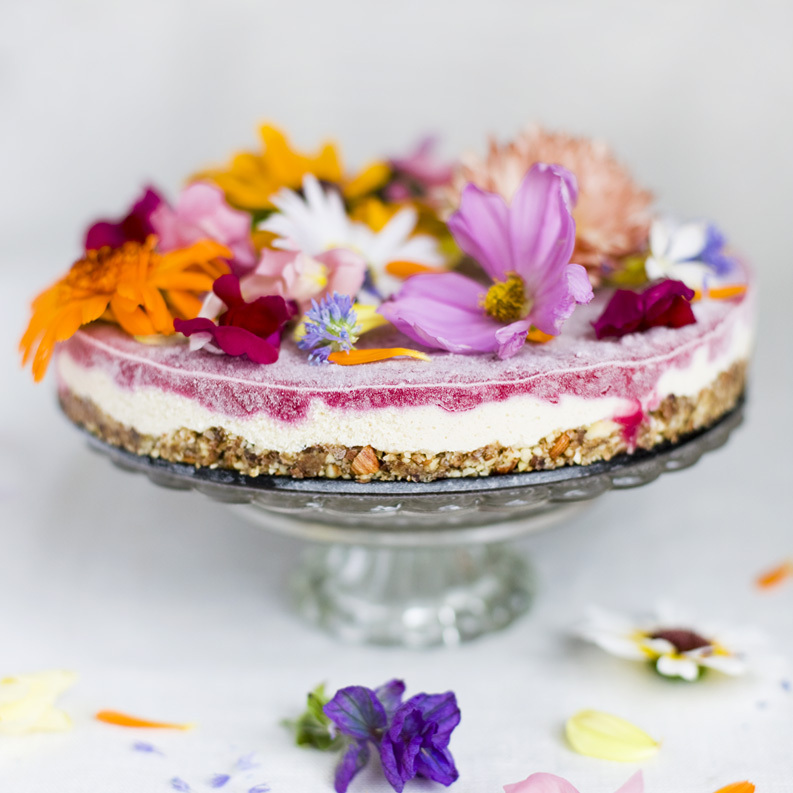 Also, the blog Green Kitchen Stories has some stunning baking recipes like the ‘flower power cake’ pictured above. Find the recipe here. Their cook book is one of my favourites. Freedom to create your own cakes and not rely on a baker’s selection allows you to sneak in some great ingredients! While traditional wedding cakes have always been either fruit cake or sponge cake, it’s not uncommon to see different variations of cakes nowadays. In fact, some wedding cakes aren’t wedding cakes at all. Take Zucchero Patisserie’s Croquembouche cakes for example. After years of working with M&S and multi-Michelin star restaurants, the bakers of Zucchero developed a tower of profiteroles that “is radically changing the shape of “wedding cakes” by providing a distinctive twist to the traditional”. We also see everything from cheese wheels to pancakes being used as wedding cakes. Preheat your oven to 165 deg C, and mix the dry ingredients and the honey in a mixing bowl. Next, blend the bananas, prunes and dates together in a blender until creamy. Add the dry ingredients to the banana mash a bit at a time, mixing until fully incorporated. Put this in a greased baking pan, and bake in the oven for 30-40 minutes. The longer you bake the cake, the firmer it gets, so make sure you check it from time to time. These are the inspirational tips for those who are not able to make his own wedding cake. If anyone feels That it’s not possible to make cake at home, then once read above shared information you will find what Mistakes you are doing during the cake making? I am really thankful to the author of this post who tells everything very nicely and creatively.